Shopping for a new fridge freezer can be a daunting task. With the thousands of fridge freezers available on the market, the problem at hand is no long whether you can find a fridge with all the desired features, but rather, finding one that will suit all your needs at the lowest cost possible. Here our goal is to equip you with the knowledge so that you can make an informed decision. We are here to walk you through the research and purchase of a new fridge freezer, while avoiding some of the common pitfalls. So let’s get started, shall we? It has a freezer compartment on top of the fresh foods compartment and typically takes up about a third of the unit. One potential drawback is that it may be hard for kids or seniors to reach the freezer. These are rather similar in design to top freezer models except that the fresh food compartment is at eye level which is often more convenient. The freezer comes in either a drawer or swinging-door compartment. The most common and cheapest type are the freestanding models, which provide a great deal more mobility if you decide to move it later on compared to built-in fridge freezers. Freestanding fridge freezers come in a variety of colours and finishes to match your existing kitchen. You can choose to have the freezer at the bottom or the top. Freezers at the top tend to be more compact than those at the bottom. Built-in fridge freezers are integrated into a kitchen cabinet and are hidden behind a door. Many opt for this type to save space or simple to give the kitchen a cleaner layout. However, there are fewer models to choose from than if you buy a freestanding appliance. In fact, you may have no choice if you’re buying one as part of deal for a fitted kitchen. Also expect to pay higher prices than for an equivalent freestanding model, which can often double the cost. This is one of the more common American fridge freezer types found in the UK. In this kind of fridge, two doors lay side by side, one leading to the fresh food compartment while the other, you guessed it, leads to the freezer. You typically get a larger and better-organized freezer with this type of unit. Another advantage is that the doors don’t need as much clearance as the traditional refrigerators, thus making them better suited for smaller kitchens with narrow walkways. Many often include a built-in water and ice dispenser on the door, which can be a rather useful feature. This is a somewhat common model in the United States, but may be a little harder to come by in the UK. It is a sort of hybrid between the popular side-by-side model and the bottom freezer model. The side-by-side fresh food compartment is on the top, while the freezer drawer is on the bottom. The benefit of a French door refrigerator is energy conservation—only a small portion is opened at a time. It goes without saying that these are also typically priced the highest. Best for small apartments or dorm rooms where space is the key restriction. These are much smaller than their traditional counterparts and can almost be used anywhere that has an outlet. While they may not include some of the more nifty features, most of them do a rather good job of their primary focus—keeping the inside cold. 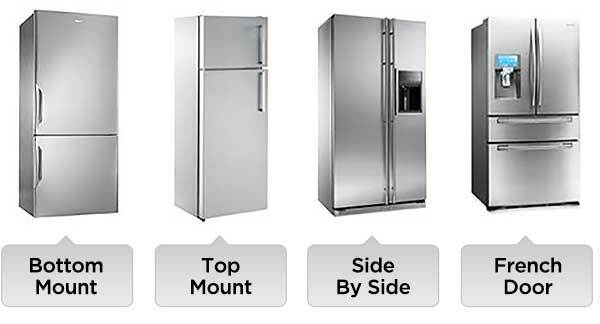 What to Look for Before Buying Fridge Freezers ? This may seem rather obvious but you’ll be surprised how many people spend days or even weeks researching all the features and specifications, only to discover upon delivery that it simply doesn’t fit! This is especially true when people purchase American fridge freezers for the first time and don’t realize just how monstrous they are compared to the traditional fridge freezers. So our first step is determining where exactly your new fridge freezer is going to be placed. If you live in an apartment or a dorm room and space is the key restriction, you may opt for a table fridge freezer, also known as a compact fridge freezer. These are much smaller, and usually quite a bit cheaper, than their traditional counterparts and can almost be used anywhere that has an outlet. While they may not include some of the more nifty features, most of them do a rather good job of their primary focus—keeping the inside cold. Table top fridge freezers can be ideal for keeping just a few beverages and some frozen products. On the other hand, if space is not a big concern of yours, then we recommend you going for a more traditional-sized fridge freezer. These come in various sizes and some can be truly gigantic, so first of all you should take some measurements of where you will be placing your new fridge freezer. Besides measuring the width and depth, don’t forget to measure the height, as some ceilings, especially those found in older houses, may be too low to accommodate some of the more modern fridge freezers. Also, don’t forget to leave a few inches of space in the back for the condenser coils and wires! The capacity you’ll need for a fridge freezer will vary depending on many factors such as how often you eat in, how often you typically stock up on food, and the type of items you’ll be storing. Nevertheless, as a general rule of thumb, you will probably need around 80 liters, (or 4 to 6 cubic feet if you live in the States) of fresh food compartment for every adult in the household. In your pursuit to save money on a fridge freezer, don’t forget to also save on the operating costs! The energy rating of appliances ranges from A++ to G, with A++ being the most energy efficient. While a higher energy rating might cost you a few extra bucks up front, keep in mind the money that can be saved later on through lower electricity costs! Nowadays, there are many A, A+, and A++ models out there and you shouldn’t have to settle for anything less than an A. If you live in the States, try to purchase those with the Energy Star certification. Appliances with this label are certified as energy efficient—using 15 percent less energy than required by federal standards. The freezer star rating for freezers gives you an approximation to help you determine how long it can freeze specific items. The higher the number of stars, the colder and longer the food stored can last. 4 stars means an ice box temperature of -18° C or colder with the ability to freeze fresh food, and store food for up to 3 to 12 months. 3 stars means an ice box temperature of -18° C with the ability to store pre-frozen food for up to 3 to 12 months. 2 stars means an ice box temperature of -12° C with the ability to store pre-frozen food for up to 1 month. 1 star means an ice box temperature of -12° C with the ability to store pre-frozen food for up to 1 week. 0 stars is only suitable for making ice. Long gone are the days of when only white fridge freezers are available. Today fridge freezers host a variety of colors and styles to accommodate your aesthetic needs, whether that means black, silver, or even pink. Well, hopefully not pink. While we believe that function should trump fashion when it comes to purchasing household appliances, a fridge freezer that sticks out like a sore thumb in your kitchen may not be an acceptable compromise, either. Take a look around your kitchen and write down a few notes. What would fit well with your current kitchen layout and what might not? When in doubt, a neutral color such as silver, white, or black is probably your best bet. Nowadays, almost every fridge has some extra nifty features beside its basic functions. While a fridge freezer with a few added features will undoubted cost you a bit more, many can help make your life easier and more enjoyable, and should be taken into consideration. Some of the more common features include super-cool, fast-freeze, frost-free, holiday button, filtered-water-and-ice dispenser, LCD displays, customizable shelves, climate control, and creative storage.